In many ways, the decision to get a dog is a big one. It requires a lot of responsibilities, especially if you live in an apartment. But, the rewards are also just as plentiful. A dog is a loyal companion that can bring joy to a household. Adopting a dog is one of the best ways to find the family’s new member. First, you can save a life. Also, adoption is usually cheaper than purchasing a dog. Most dogs up for adoption are already spayed or neutered. But, the most important reason is that adopted dogs are just as loving as purchased dogs. Here, we look at some of the dog breeds that are perfect for small living spaces. Beagles may not be the top-of-mind choice when it comes to dog breeds suitable for apartments, but they can be an excellent choice provided they are placed in the right home. This is a feisty and energetic breed, stemming from being bred to be hunting companions. Pick a beagle if you can commit to giving them enough time for exercise. The advantage of beagles is that they are very smart, so they can be trained to follow the rules. Senior beagles are also perfect because they have more mellow personalities. The build of chihuahuas almost makes it seem like they were born to live in apartments. Aside from their small sizes, they also do not need a lot of space for exercise. These traits make them ideal for tiny living spaces. Chihuahuas might get a bit skittish around strangers so early socialization opportunities are important to get them used to common spaces. Mixed breeds can be an opportunity to get the best traits of different breeds in a single package. For example, a Corgidor – a mix of a corgi and a Labrador – can be perfect for an apartment. You get the cheerfulness of a Labrador in a more compact, short-legged size. Other mixed breed dogs suitable for apartments are Shi Tzu and Chihuahua mixes. Look for smaller frames and more obedient personalities as the dominant traits. American bulldogs are descendants of the more popular Old English Bulldogs. They were originally bred to be workers, like farm guards. They have stocky bodies and strong heads. With the right amount of exercise, American bulldogs can thrive in small living areas. They can be quite social and will not be intimidated by other animals or people. This trait is an advantage, especially in an apartment complex. However, some cities and housing areas have rules against owning them, due to their physical similarities to the pit bull. It is wise to check with the landlord first about possible restrictions. The Bichon is a small dog, reaching a height of about one foot at its shoulder. It is mainly known for its hypoallergenic fun, which is very soft and fluffy. The head is rounded, with black features. Bichons are a friendly breed. They often get along well with other pets and children. Their approachable nature makes them ideal for crowded settings, like city apartments where there are a lot of people. The Bulldog is characterized by its loose skin and a pushed in face. Its fur is short and comes in different patterns. This dog is a heavyweight, often reaching 50 lbs. But, they are excellent apartment companions because of their laidback personality. Bulldogs are fine lounging around a small space, but they do need regular exercise to stay healthy. Maltese are popular toy dogs. They rarely weigh more than 7 lbs. Their coat features long and smooth strands. Their small size means that they do not require much space to be comfortable. The delicate appearance of the Maltese is the opposite of its hardy disposition. These dogs can be trained to become excellent watchdogs. The Boston Terrier is another dog that works for apartments because of its size. The breed is only a little over a foot tall. However, the Boston Terrier does require a lot of exercises, so they need to be walked often. Otherwise, they can become unruly and noisy. Dachshunds are extremely smart. Their intelligence is the primary reason why they make good companions in an apartment. They will not make a fuss. Dachshunds are also small dogs and can be exercised indoors. They make great companions for city apartments where it might not always be practical to go outside. This breed might seem surprising, considering that greyhounds are known for their speed and size. They are the perfect example that temperament matters more than size when it comes to picking an apartment companion. If they are well-exercised, their gentle demeanor will make them calm enough for small apartments. If you are looking for the personality of a big dog but in a more compact size, then the Lhasa Apso is the breed for you. It is loyal, exuberant, and can be easily trained. However, it does require socialization at an early age. Get them while they are still young, so they get used to living with people in close quarters. The Pomeranian works for apartment living because they are quite independent. Indoor exercise is usually enough, and they only need to have their coats brushed weekly. However, they are barkers, so they need to be trained early on if your apartment has strict noise regulations. Toy and miniature poodles are apartment-sized. Their bodies are small and can easily manage in small spaces. They are also very intelligent, so they can be trained to be sociable and quiet. Also, their short legs mean that they can get their exercise from running around the apartment. Known for the stubby bodies and pushed in faces, pugs are loyal and affectionate pets. They do not need a lot of exercises and are generally quiet. Their energy levels, size, and temperament make them perfect for apartment buildings with strict pet policies. Living with a dog in an apartment is doable if they are properly cared for. The main considerations are managing their energy levels and hygiene. A dog that gets enough exercise will generally be calm and quiet. Keeping them clean is also important to prevent ticks and odors at bay. The first thing every dog owner should do is find out the rules within the apartment building when it comes to dogs. Some buildings might have size restrictions. It is best to get acquainted with these rules, so the proper breed can be picked out. Make sure to also keep up-to-date with vet appointments. Apartment dogs technically do not just live with you. They live with the rest of the people within the property. They need to be parasite-free, so they do not cause infestations or diseases. They also need to get their vaccines, in case they accidentally nip at someone. All dogs, even the gentlest breeds, need to get used to having people around. Apartments are unique settings because they are high-traffic locations. People go in and out of elevators. Children are always playing in the common areas. Your dog needs to be properly trained so these do not become stressful situations. One of the biggest considerations of living with a dog in an apartment is the noise. Some dogs are yappier than others. It is why picking the correct breed is important. However, even quiet breeds need some nudging towards proper behavior. There are several humane tricks you can use to help your dog learn to manage noise levels. 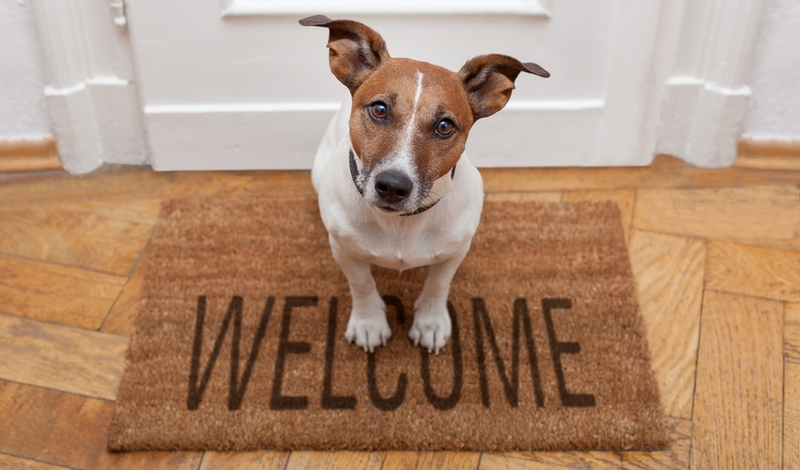 Finally, make sure that your dog is properly housetrained. Make sure you set aside time to walk the dog outside. Make sure to clean up after your dog, in consideration of your neighbours. If it is not always possible to go outside, there are some measures that can be taken so that the dog can do its business indoors. For example, piddle pads are perfect during the training stage. Just ensure that the waste is disposed of properly. Having a pet, whether in an apartment or in a much larger space, is a commitment. If you plan on having a dog living with you in an apartment, you are in for a treat. Dogs are wonderful and loyal pets. But, you need to return their loyalty by making sure that they are happy and cared for.